What Vitamins & Minerals Promote Hair Regrowth? If you've noticed that your hair seems to be thinning, growing slowly or brittle and breaking off easily, you may not be getting the right nutrients. A poor diet that doesn't give you adequate vitamins and minerals can affect your scalp and hair health. Making sure you eat a balanced diet can help you regrow your hair, if the cause was due to inadequate nutrition. See your doctor if your hair loss persists. Your body uses vitamin C to help build collagen, a protein that gives tensile strength to blood vessels, bone, tendons and ligaments, according to the Linus Pauling Institute. This essential nutrient also keeps your scalp healthy and infused with oxygen-rich blood to help support hair growth. Additionally, vitamin C helps the body absorb iron from plant foods. Add vitamin C to your balanced daily diet with a half-cup of strawberries, an orange or a cup of steamed spinach with chopped tomatoes. The B vitamins are essential nutrients your body needs for metabolism -- to break down foods and produce energy. The University of Maryland Medical Center notes that these vitamins also help keep your scalp and hair healthy and promote hair growth. To get enough B vitamins in your daily diet, eat more complex carbohydrates such as brown rice and other whole grains. Salmon, dark, green leafy vegetables and seaweed are also a good sources of B-6, B-12 and other B vitamins. If you have anemia due to low iron levels in your blood, or if you are simply not getting enough iron from your diet, you may have noticed thinning hair. This mineral is important to build healthy red blood cells, which carry oxygen and nutrients to your scalp and hair and throughout the body. The Cleveland Clinic notes that iron comes from both animal and plant sources. You can get a healthy dose from foods such as lean beef, turkey, chicken liver, eggs, oysters, clams, tuna and shrimp. Iron from plant sources is less easily absorbed by the body, but plants are still good sources of iron. Add oatmeal, beans, lentils, tofu, spinach, peanut butter and whole-wheat bread to your diet. According to the University of Maryland Medical Center, drinking coffee or alcohol can affect how well your body absorbs vitamins and minerals from the foods you eat. Smoking tobacco can also hinder nutrient absorption, affecting how healthy your scalp and hair is. 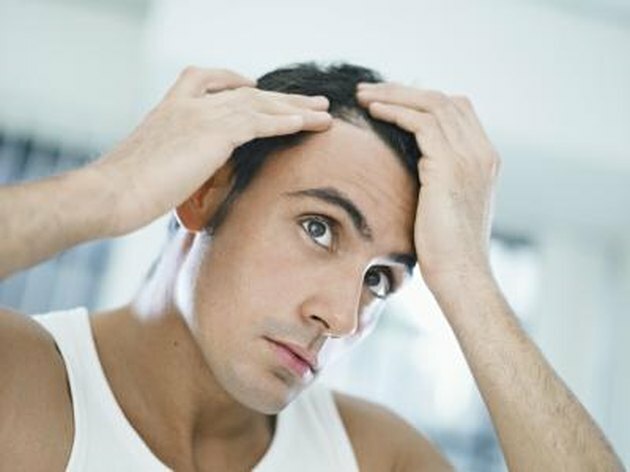 Hair loss can also occur from food allergens such as dairy, wheat, soy, corn and food additives. Your doctor can test you for these to determine whether your hair loss or thinning is linked to your diet. Can You Reverse Balding With Diet? Can Vitamins Increase Blood Oxygen Level?